Converting your screened porch into a 4-track room provides significant increases in protection from the elements. Covered, screened porches do provide some protection on a rainy summer day, but high winds and driving rain can still whip their way through screens, soak your indoor-outdoor carpet or patio furniture, and send you inside. If you have decorations, such as potted plants, on your screened porch, they too can become victims of the high winds that often accompany summer thundershowers. The sliding panels of a vertical 4-track room give you the option to batten down the hatches during inclement weather and keep your porch, and your belongings, dry. 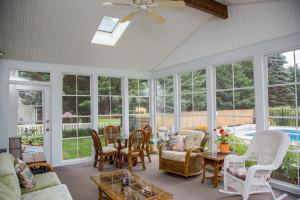 A screened porch is, in most cases, limited to two main seasons of use. Late spring through early fall is the standard peak season period for these types of porches. A vertical 4-Track room creates a three-season patio enclosure and extends the seasonal use of a screened porch to an earlier time frame in the Spring and a later one in the Fall. The ability to close window panels provides protection from the aforementioned winds and creates a warmer, more comfortable environment in which to enjoy your room. Vertical 4-track rooms are completely customizable, which means that you can choose the unique configuration of the paneling to suit your preferences and needs. In addition, there are a wide array of sizes, styles, and colors of vinyl track to choose from to match the color of your home. One of the best things about many screened porches is the unrestricted views they can provide while still providing protection from the heat of the midday sun or the annoyance of evening insects. A vertical 4-track room provides these same visibility benefits and advantages by offering window panels that run floor to ceiling. The last thing you want to do is to enclose your porch in such a way that it diminishes the tranquility of your home’s setting by eliminating a million dollar view. 4-track rooms allow you to maintain all the advantages of a screened-in porch while adding a few extra benefits of their own. Many homeowners enjoy the natural breeze and airflow that their screened porches provide. Add a ceiling fan and a screened porch can achieve amazing temperature regulation even on a hot summer day. Some types of enclosed porches result in reduced airflow in exchange for the protection from the elements that they provide, but a 4-track room does not! 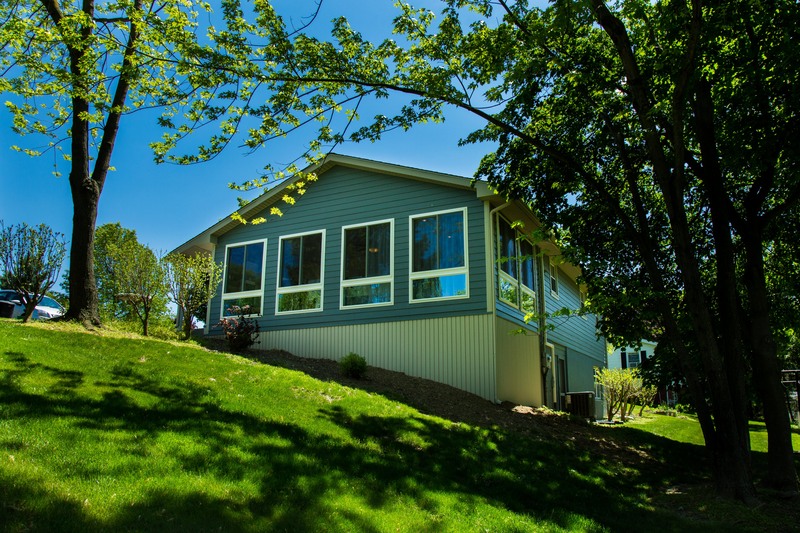 A vertical 4-track room gives you the option to slide windows open from the top or bottom and also remove window panels to achieve the same airflows as the most comfortable screened porch. On top of that, it gives the ability to utilize the room in so many additional ways for extended periods of time. In this way, vertical 4-track rooms truly provide a homeowner with the best of both worlds! If you are looking for a way to maximize your porch space and create a more enjoyable and functional space, a vertical 4-track room may be the patio enclosure you are looking for. If you are considering an upgrade to your screened-in porch, contact us at 717-399-4708 for a free quote or stop by our showroom to get inspired!